Can energy refurbisment strategies enhance social cohesion? EnerPOP is a multidisciplinary project aiming to promote social and environmental sustainability in public housing in Milan. The municipality of Milan is committed to improving the quality of life of its citizens living in suburban areas. The refurbishment of outdated or inefficient public housing buildings is part of this strategy, but it is not enough alone; the involvement of tenants plays a crucial role as well. 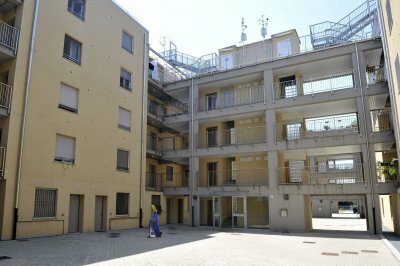 The case study is the public housing of Feltrinelli 16, in the south-eastern Milanese outskirt, where about 500 people from 30+ nationalities live. The 150+ flats, distributed over two blocks of five floors each, underwent a major energy refurbishment during the European project EU-GUGLE (funded under the Seventh Framework Programme of the European Commission), including thermal insulation of the external walls and roof, replacement of windows and doors, renovation of mechanical systems and connection to district heating, installation of mechanical ventilation with heat recovery through an exhaust-air heat pump and installation of photovoltaic panels (first public house in Milan with PV). More details can be found here. The advantages gained by such technical implementations in terms of energy savings and improved indoor comfort conditions risk being weakened by the sometimes energy-consuming behaviours of the inhabitants, mainly due to lack of information or routinised daily practices. EnerPOP intends to engage the residents of Feltrinelli 16 in a multiscalar process of technological training and social connection, where the targeted environmental and energy challenges are opportunities to generate a sense of community, as a starting point towards more sustainable behaviours at building scale. Through a participatory approach, tenants will play a primary role in the definition of the activities carried out during the project. The planned outcomes include not only the documentation on fieldwork activities with the tenants (e.g. publications and report) but also a guide for social impact assessment and interventions coming along with energy retrofit plans, which may be used to replicate and implement what has been learnt in and through Feltrinelli 16. EnerPOP is funded under the Polisocial Award programme of Politecnico di Milano. POLISOCIAL AWARD competition aims to promote research projects with a high social impact. The programme is financed through a share of income tax (5x1000 IRPEF) that Italian taxpayers choose to devolve to Politecnico di Milano. The working team set at Politecnico di Milano is composed of eERG (Department of Energy), LabSimUrb (Department of Urban Studies) and Laboratorio Immagine (Department of Design). The project is supported by a larger network of stakeholders including Amici del Grattacielo dei Mille, AREA Ridef, Centro Arti Terapie Milano, Collaboriamo, Future Energy, Fondazione Empatia Milano, Luogo di vita e di incontro (Lu.Vi) Onlus, Seven Stars s.r.l., Spazio Aperto Servizi, Teicos UE s.r.l.